You asked for it, you got it! This rather unassuming looking dip was a major hit at our supper club and many of you asked for the recipe. The pesto recipe is mine, developed for my class on pumpkin and squash at Meijer Gardens. 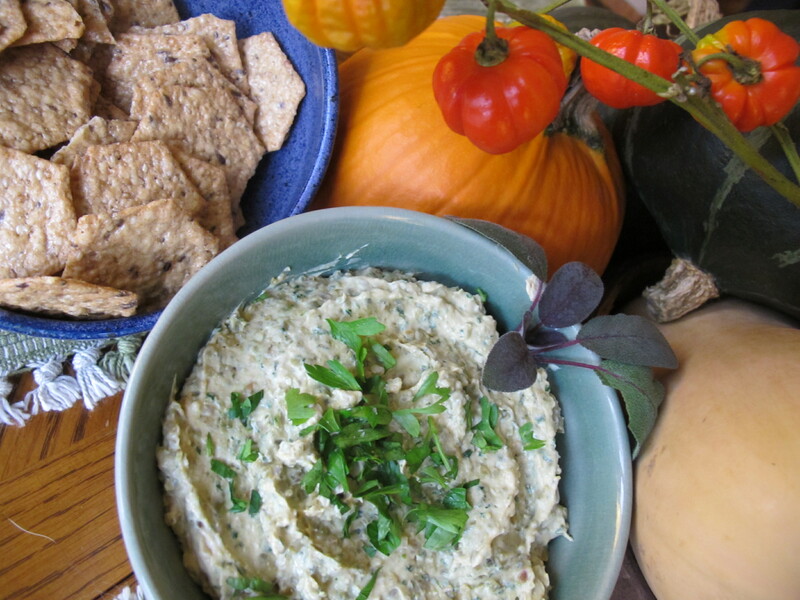 It becomes swoon-worthy when paired with Miyoko Schinner’s Cashew Cream Cheese, which I found the recipe for here. Miyoko is one of my favorite plant-based cheesemakers. She’s brilliant. Please buy her book “Artisan Vegan Cheese.” If you like, you could also pair this with goat cheese or cream cheese. Roast the pumpkin seeds in a cast iron pan over medium heat. Continue to stir the seeds until they start to pop. You want to smell a nutty aroma and see the seeds begin to brown. Keep shaking and stirring while this is happening. You will get a feel for this. You do not want smoking and burning. Move seeds to a food processor. Add the sage, parsley, roasted garlic, parmesan and salt to taste. Process until it is a coarse puree, and all ingredients are evenly distributed, stopping the processor and scraping the ingredients back toward the blades if you need to. Mix pesto with 6-8 ounces of your choice of cheese until fully combined. Serve with crackers. Practice humility when people swoon over it. Thank you, Sue! Can you give the recipes for the other dish you made (was that pasta?) and Roger’s Enchilada please?